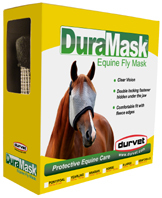 Horse Fly Mask SuperMask II, Dura Mask, Kensington, UltraShield, Opti Force! 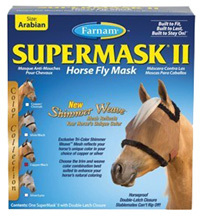 • SuperMask® II Horse Fly Mask w/ Shimmer Weave WITHOUT EARS: Combines function with fashion like no other fly mask! New, exclusive tri-color Shimmer Weave™ mesh reflects your horse’s unique color, in your choice of copper or silver. Stays on your horse with the double-latch closure stablemates can’t rip off! It fastens twice for double security. The double-latch closure is located under the jaw, not on the cheekbone, making it harder for other horses to reach. Keeps flies, dust, dirt and debris away from your horse's eyes. 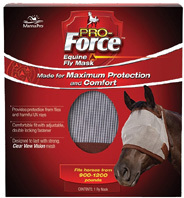 Protects your horse's eyes and face from harmful UV rays and it aids healing after eye injuries. The see-through mesh does not obstruct vision. Plush, flyproof trim keeps flies out, providing maximum comfort without rubbing or harsh abrasion. ORDER NOW! Available in 3 sizes: PLEASE SELECT CAREFULLY! Arabian: 700 lbs. - 900 lbs. Horse: 900 lbs. - 1200 lbs. X-Large: 1200 lbs. - 1500 lbs. 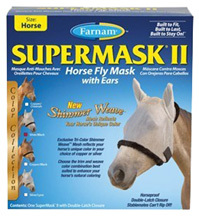 • SuperMask® II Horse Fly Mask w/ Shimmer Weave WITH EARS: Combines function with fashion like no other fly mask! New, exclusive tri-color Shimmer Weave™ mesh reflects your horse’s unique color, in your choice of copper or silver. Stays on your horse with the double-latch closure stablemates can’t rip off! It fastens twice for double security. The double-latch closure is located under the jaw, not on the cheekbone, making it harder for other horses to reach. 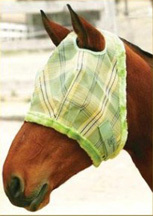 Keeps flies, dust, dirt and debris away from your horse's eyes. 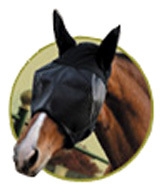 Protects your horse's eyes and face from harmful UV rays and it aids healing after eye injuries. The see-through mesh does not obstruct vision. Plush, flyproof trim keeps flies out, providing maximum comfort without rubbing or harsh abrasion. ORDER NOW! Available in 2 sizes: PLEASE SELECT CAREFULLY! SuperMask II Horse Fly Mask: SuperMask II Horse Fly Mask is designed with soft mesh ears are comfortable on horses, tough on flies, gnats and mosquitoes. Fleece-lined ear opening and nose band conform snugly to keep flies out. 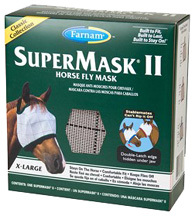 SuperMask II Horse Fly Mask keep flies away from eyes without obstructing vision. Protects eyes and ears from flying dust, dirt and debris. Helps healing after eye injuries. Use as a sunscreen to protect eyes and face. No rubbing or harsh abrasion. Often lasts more than one season. Horse With Ears: 900 lbs. - 1200 lbs. Horse No Ears: 900 lbs. - 1200 lbs. Arabian With Ears: 700 lbs. - 900 lbs. Yearling/Pony No Ears: 500 lbs. - 700 lbs. SuperMask Miniature Horse Fly Mask: America’s Favorite Fly Mask Fits Even the Smallest Faces! SuperMask® Miniature Horse Fly Mask is Built to Fit, Built to Last, Built to Stay On! Size doesn’t matter to flies. They bother miniature horses as much as they bug the big ones. New Adjustable poll and throatlatch on all miniature horse SuperMasks®. Snug-fitting, fleece-lined ear opening and noseband keep flies out. 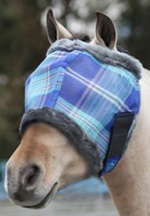 Protects miniature horse’s face from flies, dust and dirt. Shields face and eyes from sun’s harmful UV rays. Helps speed healing of eye injuries and facial wounds. Controls flies without pesticides. Soft, sewn-in mesh ears allow horse’s ears to move comfortably while protected. See-through netting won’t block vision. ORDER NOW! • SuperMask Miniature Horse Fly Mask Foal/Pony: Foal/Pony / No Ears. 200 - 500 lbs. (Most Breeds). ORDER NOW! X-Large With Ears: 1200 lbs. - 1500 lbs. X-Large No Ears: 1200 lbs. - 1500 lbs. Foal/Pony No Ears: 200 - 500 lbs. Kensington Bug Eye Fly Mask: Kensington Bug Eye Fly Mask provides full coverage and protection with ears that are designed with a nylon liner for added comfort and to protect against abrasions. Features a double locking hook and loop closure with a heavy-duty elastic neck strap, for added durability and safety, eye darts to keep mask off facial area and fleece for extra comfort. 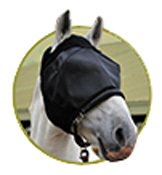 Kensington Fly Masks are designed to stay on the horse's head with double fastening hook and loop preventing the mask from being easily pulled off. For safety's sake, designed with 2 inches of heavy elastic at the bottom of our mask so that if a horse does get hung up, the elastic stretches, allowing the mask to be pulled over the head without choking the horse. 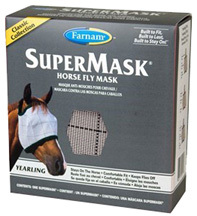 FLY/PEST CONTROL: Fly Mask With Web Trim Small/Yearling 500-700 lbs. 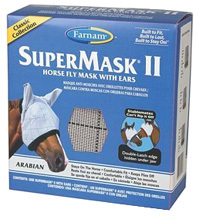 FLY/PEST CONTROL: Fly Mask With Soft Ears & Removable Nose Piece Small/Yearling 500-700 lbs. 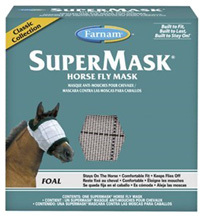 FLY/PEST CONTROL: Fly Mask With Web Trim Pony 500-700 lbs. • Dura Mask Equine Fly Mask WITHOUT EARS: Rub free design with all edges trimmed in fleece Decreased attraction of debris with fleece trim. Superior eye dart stitching for enhanced safety. Extra reinforcement for durability. Excellent quality at an incredible value. Protects from flies and other biting insects. Clear vision. Double locking fastener hidden under the jaw. Comfortable fit with fleece edges. ORDER NOW! Available in 6 sizes: PLEASE SELECT CAREFULLY! Yearling: 500 lbs. - 700 lbs. X-Large: 1200 lbs. - 1600 lbs. 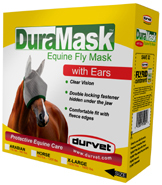 • Dura Mask Equine Fly Mask WITH EARS: Rub free design with all edges trimmed in fleece. Decreased attraction of debris with fleece trim. Ears are made of a comfort fit mesh. Superior eye dart stitching for enhanced safety. Extra reinforcement for durability. Excellent quality at an incredible value.Protects from flies and other biting insects. Clear vision. Double locking fastener hidden under the jaw. Comfortable fit with fleece edges. ORDER NOW! 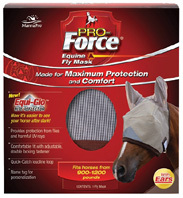 Pro Force Fly Mask: Equine Pro Force Fly Mask provides maximum protection from flies and harmful UV rays. Designed to last with strong, Clear View Vision mesh and comfortable fit with adjustable, double locking fastener. Outfitted with New Equi-Glo Nite Reflector making it easier to see your horse after dark and improves visibility for cars and hunters. Includes Quick-Catch lead line loop. Fits horses from 900 to 1200 lbs. 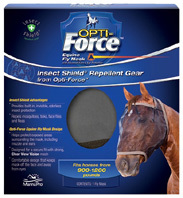 Opti-Force Insect Shield Repellent Gear: Opti-Force Insect Shield Repellent Gear provides built-in, invisible, odorless insect protection. Helps repel mosquitoes, ticks, flies, and fleas (including insects that cause Lyme disease and West Nile). 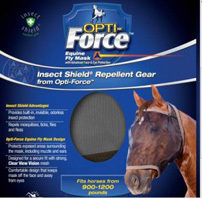 Opti-Force Insect Shield Repellent Gear is lightweight and offers the comfortable design to keepsthe mask off the face and away from the eyes of the horse. Designed for a secure fit with strong, clear view vision mesh. Fits horses from 900-1200 lbs. • UltraShield Fly Mask: UltraShield Fly Mask helps keep horses cool and dry and protect with structured eye darts and a face mesh that blocks 80% of UV rays and reduces solar glare. UltraShield Fly Mask is designed to stay in place with two-way controlled stretch fabric on the crown and jowl, extended fabric behind the ears, and a strong double-locking hook and loop closure. Lightweight, durable, and resistant to stains, mud, dirt, and debris. Machine washable. Available With and Without Ears! ORDER NOW! • UltraShield Fly Mask Horse with Ears: 900 lbs. - 1200 lbs. (Quarter Horse, Thoroughbred, Paint, Pinto, Morgan, Saddlebred, Appaloosa). ORDER NOW! • UltraShield Fly Mask Horse without Ears: 900 lbs. - 1200 lbs. (Quarter Horse, Thoroughbred, Paint, Pinto, Morgan, Saddlebred, Appaloosa). ORDER NOW! 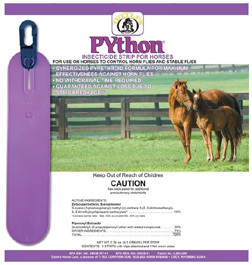 • Python Equine Insecticide Strips: Python Equine Insecticide Strips offers nonstop control of horse flies and stable flies for up to 2 months. Python Equine Insecticide Strips is made with a synergized formula of Zeta-Cypermethrin and Piperonyl Butoxide to deliver optimum effectiveness against horse flies. Each device comes with a crown piece for applying strips to a buckle or rope halter along with 3 strips and clips. 3/pack. ORDER NOW! Unlike toxic pesticides that are applied to your horse's skin, Fly Armor's patent-pending design prevents contact of its all-natural ingredients, keeping you and your horse safe and healthy. • Boot/Stall/Tack Bands: Insect repellent gear provides animals with an invisible shield of tranquility against flies, mosquitoes, gnats, fleas, ticks and no-see-ums. Ideal for use during trail and riding, event competition, travel and in stalls or paddocks. The inserts with their unique blend of essential oils are very effective against flies, gnats and mosquitoes. Bands are 7 inches long by 2 inches high. Backside has velcro hooks and a detachable self-adhesive velcro loop strip that can be placed anywhere on tack or halter or any location where insects are bothersome. The bands are lightweight, durable and washable. Inserts last approximately 4 weeks. Band features velcro hook backside and comes with self-adhesive, removable, velcro soft-loop attachment. Includes 2 bands and 4 inserts. Replacement Inserts sold separately. ORDER NOW! 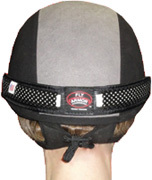 • Helmet Band: Has 2 pockets that can hold one insert in each. Inserts are a blend of all-natural essential oils that are very effective against flies, gnats and mosquitoes. The Helmet Band has an adjustable buckle for a custom fit. It is lightweight, durable and washable. Inserts last about 4 weeks and are easily replaceable. 2 inserts included. ORDER NOW! • Cheek Bands: With adjustable velcro fasteners, the bands can be attached onto tack, halter or any location where insects are bothersome. The unique scented blend of essential oils are very effective against flies, gnats and mosquitoes.The band is lightweight, durable and washable. Inserts last approximately 4 weeks. They are easily replaceable. 2 inserts included. ORDER NOW! • Noseband Xtra Strength: Contains a blend of all-natural essential oils that are very effective against flies, mosquitoes and gnats. The noseband is lightweight, durable and washable. Inserts are eco-friendly, long-lasting and easily replaceable. 4 inserts included. ORDER NOW! FLY/PEST CONTROL: Boot/Stall/Tack Bands, 2 ct.
FLY/PEST CONTROL: Noseband Xtra Strength Bands, 4 ct.
• Browband: Designed with 2 pockets that can hold one insert in each. Inserts are a blend of all-natural essential oils that are very effective against flies, gnats and mosquitoes. The browband is lightweight, durable and washable. Inserts last about 4 weeks and easily replaceable. 2 inserts included. ORDER NOW! 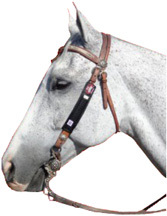 • Pollband: The band attaches on back to Poll or any tack, halter or any location where insects are bothersome. The band is lightweight, durable and washable. Inserts last approximately 4 weeks. They are easily replaceable and sold separately. 2 inserts included. 2 inserts included. • Mane & Tail Band: Great for turnouts on horses that don't wear halters or fly masks! The inserts with their unique blend of essential oils are very effective against flies, gnats and mosquitoes. Bands are 7 inches long by 2 inches high. Band has a string loop at top & velcro hooks at bottom to attach to mane or tail or anywhere you can think of. Elastic band is needed to secure section of hair and then just slide the loop through middle of hair ABOVE elastic and then run band through the loop and pull down for snug fit. Finish by securing hair inside of velcro attachment at bottom of band. The bands are lightweight, durable and washable. Inserts last approximately 4 weeks. They are easily replaceable and sold separately. 2 inserts included. • Replacement Inserts: All-natural, eco-friendly inserts are custom-made for Fly Armor Gear. A citronella scented blend of unique essential oils offers long-lasting protection and is very effective against flies, gnats and mosquitoes. 2 inserts per packs. Completely disposable upon replacement. 2 inserts/pack. ORDER NOW! FLY/PEST CONTROL: Mane & Tail Bands, 2 ct.